Russia’s blasphemy law, pushed to the limit. Anti-extremism police in Russia are investigating their most extreme case yet: whether it’s sacrilegious for a woman to wear a religious robe and fake beard in an Instagram photo. It started in April, when journalist Ksenia Sobchak was working on a feature for Snob magazine about how different religions are practiced in Russia. The corresponding photo shoot included Sobchak dressing up in priestly vestments and sporting a long fake beard—you can still see her in the garb on the online version of the magazine. Naturally, she put a posted of herself all dressed up on Instagram. Russia’s 2013 Blasphemy Law, article No. 148 of the Criminal Code, criminalizes acts that deliberately and publicly offend religious sensitivities. 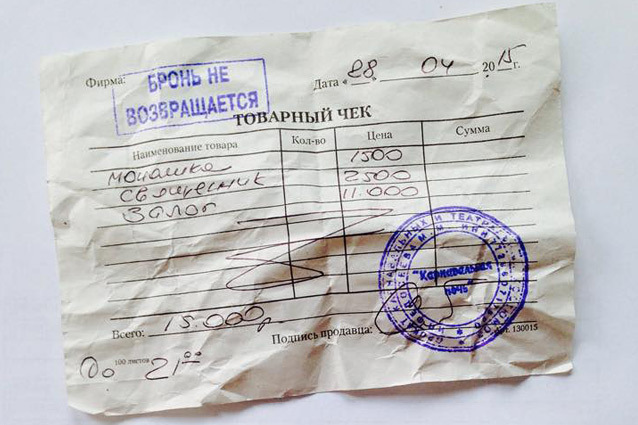 Those found guilty face fines up to 300,000 rubles ($4,400), compulsory community service, or even a year in prison. Sobchak was quickly attacked. Trolls tagged her photo “sacrilegious” and asked if she’d dare disguise herself as a Muslim cleric. It was a Kirovsk-based lawyer, Yaroslav Mikhailov, who took it to the next level, informing the Investigation Committee of Russia about the photo and claiming it “expressed clear disrespect for society and were committed in order to insult the religious feelings” of believers. In May, the Investigation Committee promised to “check [Mikhailov’s] arguments.” Sobchak was openly baffled, tweeting, “I just don’t understand why my indecent photo offends someone, while photos of fat men bedangled with gold and Breguet [luxury watches] are praised,” and showing the sales receipt from when she bought the robes in a costume shop. But she’d made powerful enemies. Vsevolod Chaplin, Archpriest of the Russian Orthodox Church, has declared she should be prosecuted. Dmitriy Enteo, leader of the popular right-wing Orthodox movement called “God’s will,” asked his supporters to write a number of government agencies, calling her apparel “apparent malice.” Popular journalist Sergey Shargunov claimed in a TV interview that there was but one step between wearing “sacred” clothes and hating Russia. Sobchak doesn’t seem to have offended her country at large. A poll by radio station Echo of Moscow found that 80 percent of people either aren’t offended or don’t care at all. But the government’s wheels were turning. On July 9, as Mikhailov gleefully posted on his Facebook page, the Investigation Committee sent the case to the St. Petersburg branch of the Center for Combating Extremism, or Center E. A shadowy, rarely-discussed police unit with branches in cities across the country, Center E is ostensibly designed to fight terrorism and extremism across the country, though it’s been criticized for instead targeting bloggers and political activists who criticize or oppose the country’s government. Mikhailov has duly reported Sobchak again for that post, too. Once again Center E—this time the Moscow branch—is investigating, though its slowness in prosecuting the journalist may be a sign it’s not terribly concerned. Sobchak has so far refused to comment. Her Instagram account, however, remains as active as ever.